The Ronald McDonald House of Dallas provides a temporary home for families of seriously ill children - and provides them with a room. 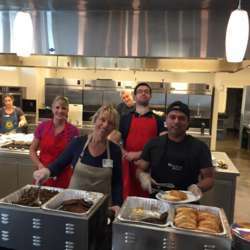 All meals are prepared and served by volunteers, so it would be great if you can join us! -I will buy all groceries - $30 cost for the event is to split the cost of groceries, please pay by Zelle. - When checking in at the front door, you will have your ID scanned and get a name tag. - We will all eat together, and clean up at the end of the activity. Keep in mind we need to cook for 70 people in total. We never know exactly how many families will show up. ONLY SIGN UP if you are sure you can make it. Ronald McDonald residents will depend on us to prepare lunch for all of them and let's not get into a situation in which we run out of food because someone cancelled last minute. I will plan the Menu and bring the Groceries.